A Missal is necessary for the celebration of the Mass: it is likely that each priest or altar would have had one. Flyleaf inscriptions record that this manuscript was acquired for Durham cathedral through Prior John Fossor (1341-1374), and that it was kept at the altar of Sts. John the Baptist and Margaret in the Chapel of the Nine Altars. The large inscription states that the book belongs to St. Cuthbert (i.e. 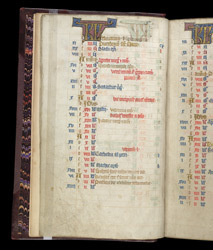 Durham Cathedral), and below this is a list of items--beginning with this very missal, and including liturgical vessels and vestments--which belong in the Chapel.